The aiming tripod was used in British and Commonwealth service as an aid in training new recruits in acquiring a proper sight picture. The one pictured here is the Canadian version of the aiming tripod. The tripod itself is quite a complex affair, consisting of three wooden legs, a triangular leg brace, tripod head, and aiming bracket assembly. The bracket assembly has two lever clamps and an interesting round knurled elevation assembly. A rifle was place in the tripod, and the recruit then moved the bracket and elevation assembly until he had a good sight picture. 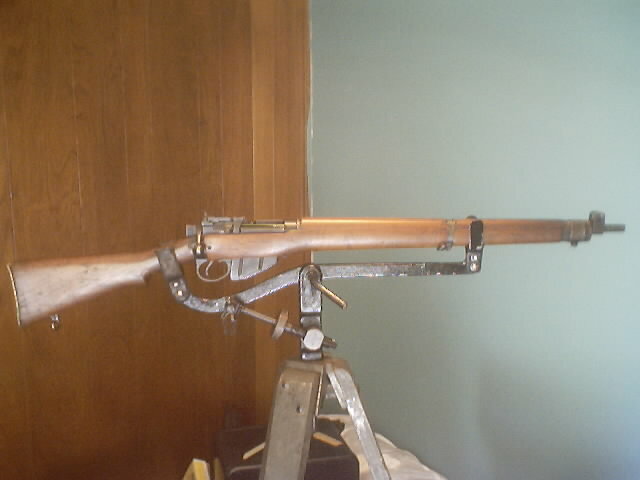 Then he would clamp the rifle in place using the lever clamps to prevent further movement. This device can be used for both No1 and No4 series rifles. 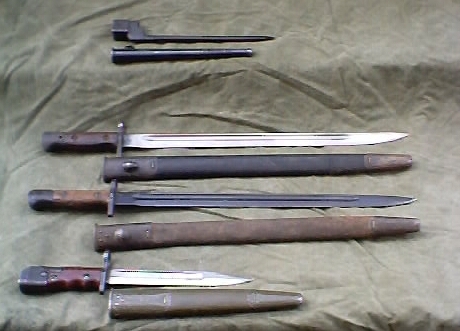 Bottom: No7 blade bayonet with swivel pommel. These bayonets were an answer to requests for a "proper" bladed bayonet.